Please welcome Jessie from Friendly Badger to Narrating Life today. Jessie is a master of the throughtful handmade gift and I'm so excited that she will be sharing a handmade favorite with all of you! You're going to love it. I'm so thrilled to be guest blogging for Miranda today, as well as flattered to have been asked. Miranda asked me to share one of my favorite handmade gifts, and it was very difficult to narrow my scope! Two years ago we did our first Handmade Holiday, making our first foray into the tradition. Last year almost our entire Christmas was handmade, and this year we are planning to go all in! With many projects planned, and many past projects to choose from, I was stymied; Then I remembered a favorite I made last year for a friend. Enter: My version of an Advent Calendar. It goes on your fridge, making it an instant showpiece where your friends and family naturally congregate. Another bonus is you're sure to cross this one off before December 1st so it's done and done! I had so much fun making it, completely from scraps and supplies on hand. Of course, you will probably have to at least purchase the tins. (Fortunately I had mine on hand.) The scheme is so simple it hardly begs a tutorial, but here are the basics. 25 tins of varying size. These are circular metal tins with clear lids, sometimes called Watchmaker's Cases. I used 3 sizes: (6) 41mm (1 5/8”), (18) 53mm (2 1/8”) and (1) 70mm ( ). These can be difficult to find in your typical craft store, but Lee Valley is a great online resource, and where I purchased my most recent lot. One thing to note: occasionally the lids have a very loose fit on the tin, and when held vertically (like on the fridge) the lid will fall off, unable to hold any contents at all. Since the metal is so soft and malleable, you can press a small indentation into the side of the tin so that the lid can 'grab' it better. You won't see this little trick once the lid is on. Circle Hole Punches. These are a girl's best friend. On my list of most-loved, oft-used, indispensable craft tools, these hover near the top. They make simple, quick, and neat work of cutting all those paper scraps to size. However, if you haven't yet amassed a collection of circle punches (though I highly advise that you do), don't despair. You can simply trace the lid of the tin, then cut your paper slightly smaller than that trace. Numbers 1-25. I used a combination of dimensional foam and chipboard stickers, rub-ons, paper cutouts, glitter and chipboard. Embellishments, if you choose. 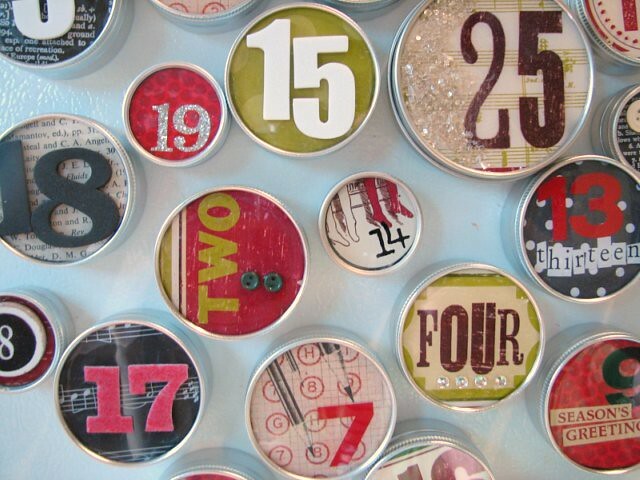 These would be fine (and simpler) with only the numbers on each tin, but I can't pass up a chance to use my Diamond Glaze, glitter paint or vintage buttons. Hot glue gun to attach the magnets to the tins, as well as other adhesives for the paper and embellishments. I used the aforementioned Diamond Glaze, but make sure whatever adhesive you use to affix the paper to the inside of the tins is clear. Goodies to fill the tins. 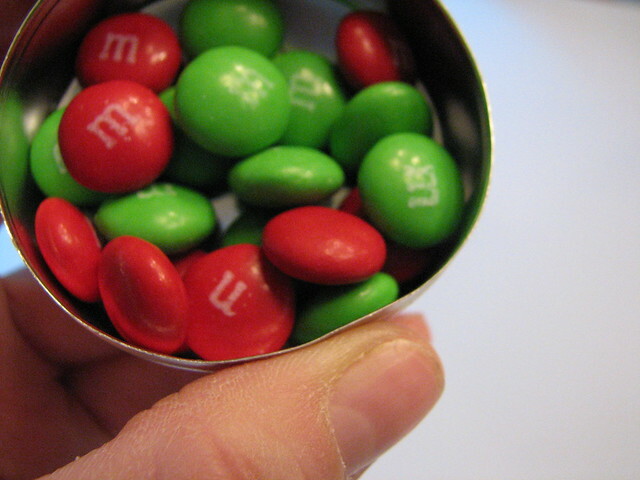 I chose to use a combination of holiday m&ms and suggested activities. You could also use small toys or trinkets, small ornaments, coupons, or other treats your family loves. Here is a great link for activities as well as gifts to fill your Advent calendar. I glued the paper to the interior of the clear lid, and used all of my other embellishments on the exterior. Go to town mixing patterns, colors, materials, and styles for an eclectic and fun look. By choosing materials within the same color palette you can still create a unified, cohesive, and clean effect. Have fun and throw out your presupposed rules! Mix those babies up on the fridge so it is more fun to find every day, and enjoy the month of December as you relish and look forward to each day. Now see, you hardly needed me to explain that all, did you? Though I'm glad I got to. Thank you Jessie! I really, really love this. I can't wait to make one! That girl is brilliant. I swear she got all of the good genes in our family! Just wanted to say this post made my day! I have been looking for somewhere to buy these tins to make christmas ornaments, so i'm excited for the link, and now really want to try to make this too! Thanks! I LOVE this project! 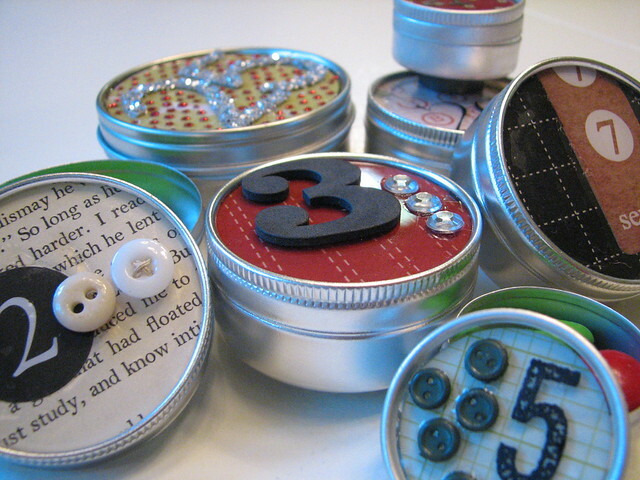 I have always loved those little tins and I enjoy using paper scraps and ephemera so this is right up my alley. Thanks for the instructions and the link to the strong magnets. Thank You for the link to the activities for advent. I tend to go overboard on our calendar trying to fill all my drawers (Mine is a small cabinet with a drawer for each day). This will definitely help. This is definitely something I can get behind! That is one seriously cool advent calendar! Thanks for sharing! I really, really love this. My sister made us an advent calendar last year, so all I need is the perfect person for this gift, and then I'll be all over it! Not that one can have too many advent calendars, of course. Ahhh - I must make this now. I love it. Can you please tell me which magnets you bought. I went to the link - but there are SOOOO many. Some are even dangerous! What? Please help a girl out and tell the exact ones that you like. Thanks so much. Thank you all for your kind words. I'm glad you liked it! Kimberlee, I hate to say but I can't make one for sale this year! I started my Handmade Holidays late and I need to focus all my energy on that to get it done! Thank you for the offer, and in the future I would probably LOVE to. You could even go slightly bigger if you wanted to as well. Hope it helps! I just ordered the tins. My girls and I will make them during their Thanksgiving visit. Thanks for the fun ideas. i adore this idea! am loving this handmade holiday series!! hi, these are just great. Love this! 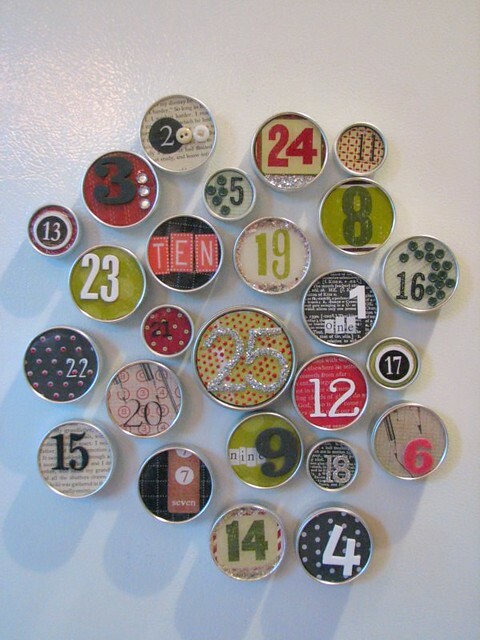 Just wanted to let you know that I'm posting it in "Top 10 Advent Calendars" at www.cheapcraftymama.com! Please feel free to stop by and grab a button or link to show that you are featured! PS I know that this is from 2010 but our site is all about inspiration, so link up anyway! How fabulous! Featuring this in my favourite DIY advent calendars round-up this week, hope that's ok (with, of course, full credit and links to you). Thank you for sharing, I love this idea. I have created a round-up of all my favorite Advent calendars and I have added yours! 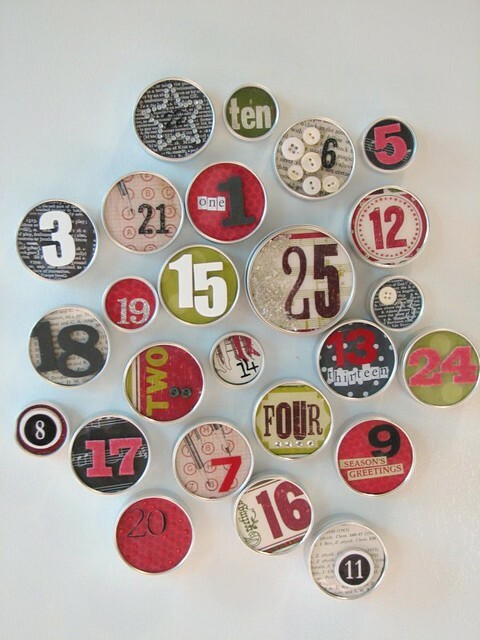 You can check it out here http://www.thecraftyblogstalker.com/2012/11/25-diy-christmas-advent-calendar.html If you would like me to remove your feature please let me know and I will take it down right away. Oh, and please stop by and grab a feature button and wear it proudly! You deserve it! Thank you so much for this tutorial! I did not have time to put together an advent calendar this year, but I have been looking for the perfect one for next year! This is absolutely adorable, and hopefully over the next 11 months I can scrounge up enough tins to make it! Thanks again!